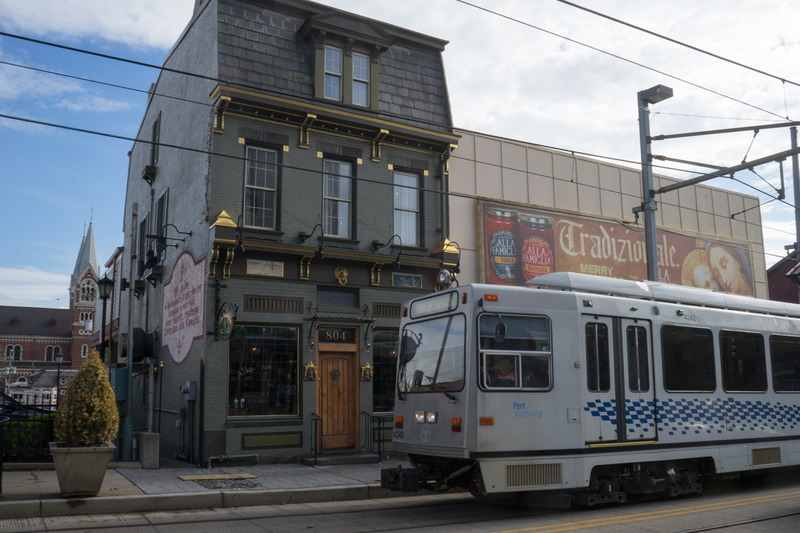 Boasting a central location and unbeatable views, Allentown could be poised to become one of Pittsburgh’s hottest emerging neighborhoods. 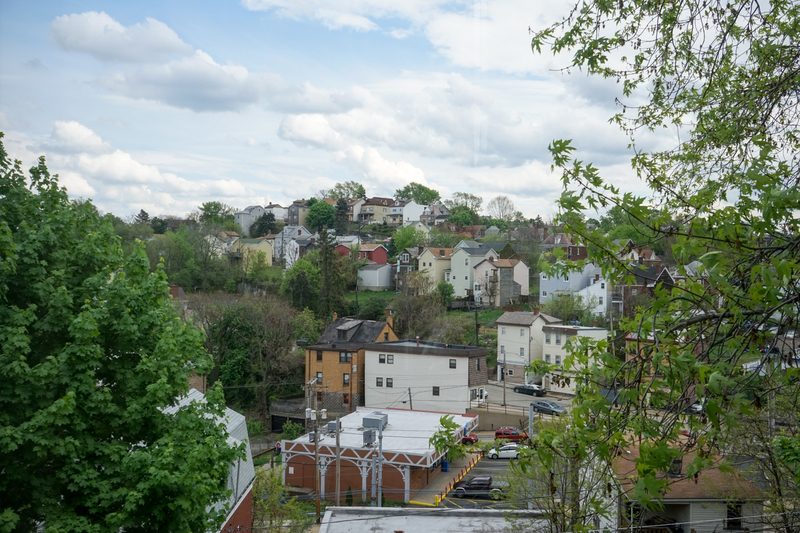 Decades ago, when the South Side was bathed in smog and pollution from the Jones and Laughlin steel mill, those with means escaped up the Knoxville Incline to Allentown, a Hilltop neighborhood replete with bakeries, grocers, and everything else a community needed to be self-sufficient. Over time Allentown became forgotten and neglected, a victim of a changing economy and a microcosm of Pittsburgh itself. But like the rest of the city, Allentown has reemerged. Mark Paisano. Brian Conway photo. Nowadays, the incline is gone. 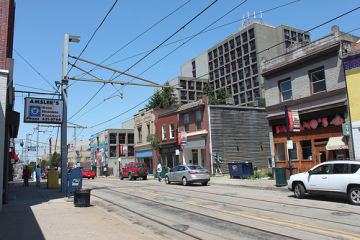 The T comes through about once a month during detours, but it doesn’t pick up passengers – the Brown line was eliminated in 2011. Nevertheless, Allentown is served by a number of bus lines, including the 43, 48 and 54. And with the Parkway and Downtown just a mile or two away, it’s easy to get from Allentown to almost any part of the city. Most of Allentown’s business district is centered on a three-block stretch of East Warrington Avenue, beginning at the intersection with Arlington Avenue. 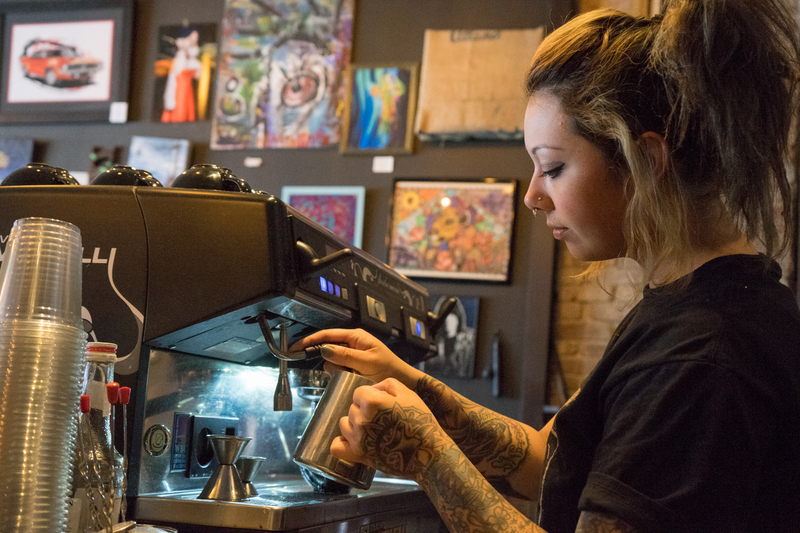 Ashley Corts of Black Forge Coffee. Brian Conway photo. Next to the Zone 3 Pittsburgh Police headquarters sits Black Forge Coffee, Pittsburgh’s only heavy metal coffee shop. Instead of Norah Jones on the radio, visitors can expect to hear atmospheric post-rock and metal from the likes of Pelican and Baroness, while enjoying some of the best cold brew in town. Around the corner sits a pair of restaurants, one old and one new. At Paisano’s, an Allentown staple since the 80s, a bevy of pizza shop staples: calzones, hoagies, wings, and fresh-cut fries. 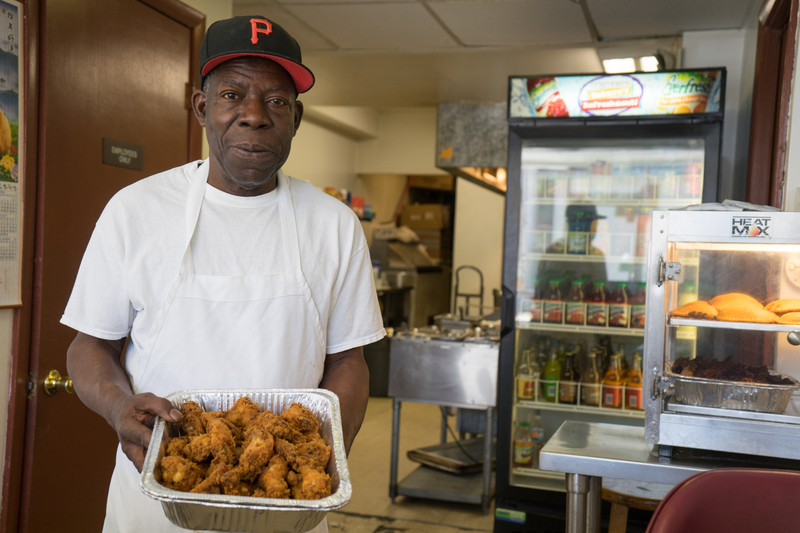 Next door, Leon’s features authentic Caribbean fare including oxtail stew, curry goat, and jerk chicken wings so tender the meat falls off the bone. Leon Rose. Brian Conway photo. 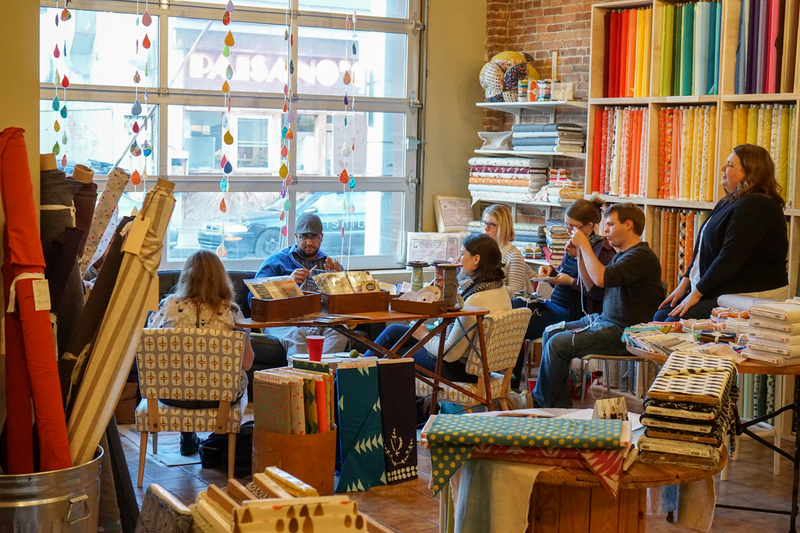 Across the street sits Spool, a new fabric and sewing store that has quickly become a regional destination for DIY makers and sewers. Co-owner Michelle Lancet grew up in the neighborhood and attended school at St. George’s so it made sense to open her own business in Allentown. “It’s so meaningful to be part of a neighborhood revitalization,” says Lancet, who credits the Hilltop Alliance and Allentown Community Development Corporation for creating a welcoming environment for her and other new businesses. 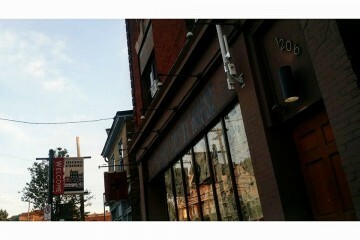 Down from Spool sits Alla Famiglia, one of the finest restaurants in the city. Upstairs, there’s a wall of photos featuring celebrities and sports figures who have dined at Famiglia, from Mario Lemieux to Sidney Crosby. Intimate, romantic, and decadent, there are few options on par with Famiglia when it comes to celebrating a special occasion in Pittsburgh. For something more informal, Breakfast at Shelly’s is around the corner. Co-owner Shelly Moeller is the daughter of Cheryl O’Leary, owner of longtime South Side diner staple, O’Leary’s. French toast, omelets, and other classic breakfast fare make up the menu. Another brunch option: Sweet Peaches. The catering company opens its doors for Sunday brunch, and holds the occasional breakfast at Black Forge. If you arrive too late for brunch, DeSalla’s Pizza is just a block away. 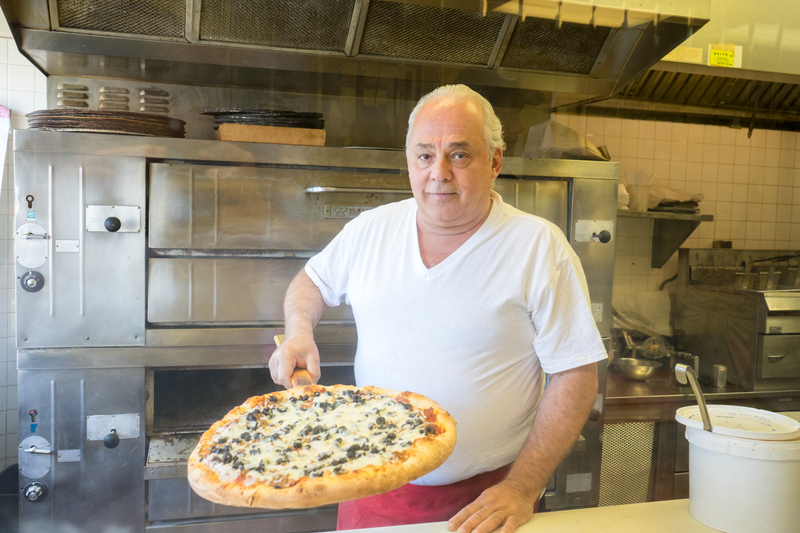 Formerly in the South Side on East Carson Street, DeSalla’s sells square pizza by the slice. Another Allentown business is Drip Lounge: part vape shop, part comedy incubator, run by the guys behind FourOneTube. Stop in for e-cigarette accessories as well as live comedy performances. The T detours past Alla Famiglia. Brian Conway photo. Other East Warrington businesses include Slayd Apparel Pittsburgh, a clothing store formerly known as 412 Kidz; Primo Cutz, a barber shop for Pittsburgh’s growing Hispanic population; and the Hilltop Tavern. Another A-town staple is Work Hard Pittsburgh. Formerly the Hardware Store, Work Hard is a co-working space for entrepreneurs and freelancers, including The Epicast Network, Sorgatron Media, and DECO Resources. The Brashear Association also maintains a Learning and Engagement Center on East Warrington Avenue. 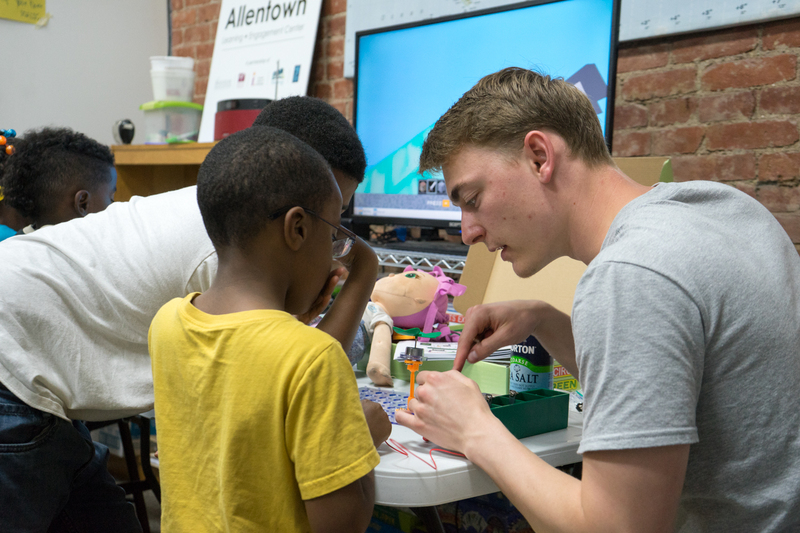 REMAKE Learning days at the Brashear Association. Outside of the business district, Grandview Park lies withing the northern border of Allentown. 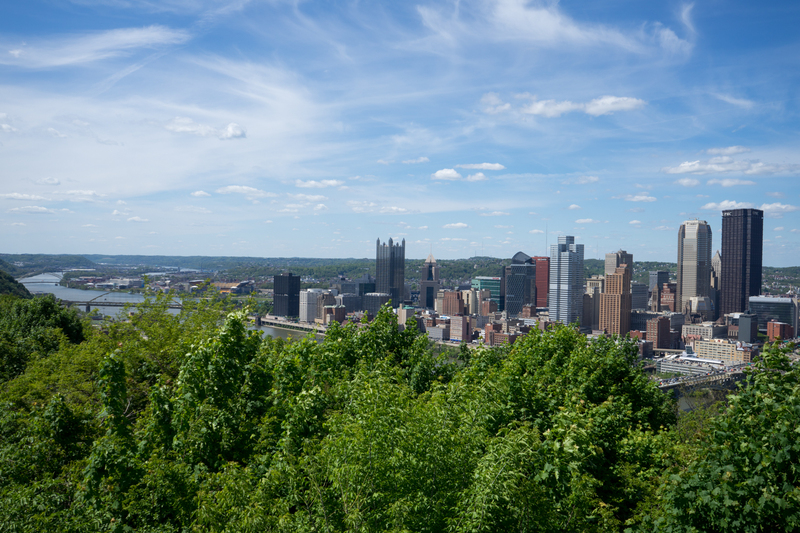 The 40-acre park boasts world-class views of Pittsburgh and is just blocks away from East Warrington Avenue. Pittsburgh seen from Grandview Park. Brian Conway photo.